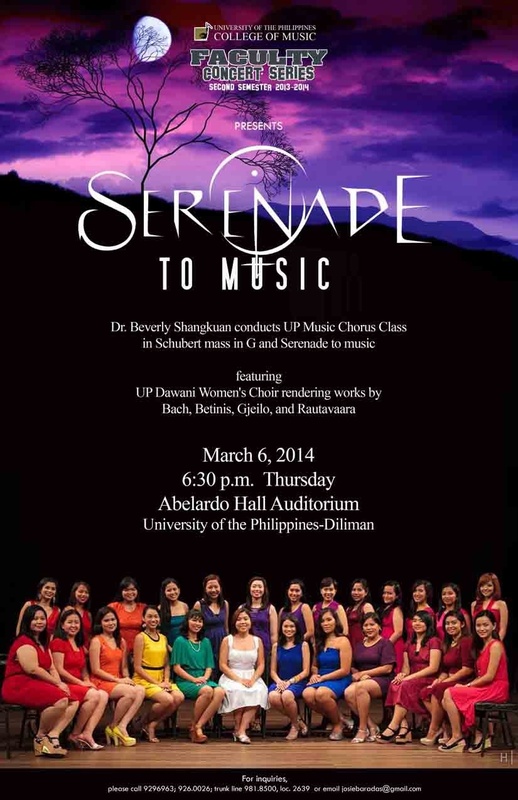 The University of the Philippines (UP) College of Music proudly presents Dr. Beverly Shangkuan-Cheng conducts the unique UP Dawani Women’s Choir in a concert titled “Serenade to Music” on Thursday, March 6, 6:30 PM in Abelardo Hall Auditorium, Quezon City. UP Dawani Women’s Choir is the only known all-women choir who performs on the concert stage in the Philippines today and is directed by the first Filipina who earned a doctorate in music arts in choral conducting from the University of Michigan Ann Arbor School of Music. The rarity of hearing blended voices of women in the realm of art music live matches the repertoire of the evening some of which will be heard for the first time in the country. These are “We have come” by Abbie Betinis, Selections from “Suite de Lorca” by Einojuhani Rautavaara, “Tundra” by Ola Gjeilo, “Things That Never Die” by Lee Dengler, and “Serenade to Music” by Ralph Vaughan Williams. J.S. Bach’s “Wir eilen mit schwachen, doch emsigen Schritten” from Cantata No. 78 will complete the first part of the program. For the second section, Dr. Shangkuan-Cheng will conduct the UP Chorus Classes render the complete Mass in G Major, D. 167 by Franz Schubert. Solo parts of the concert will be interpreted by Stefanie Quintin, Noemi Binag, Phoebe Bitoon, Ivy Buenaventura, Alyssa Dioquino, Maria Flores, Ervin Lumauag, Christopher Arceo, Pauline Arejola, John Borja, Myron dela Cruz, Lara Maigue, Louise Manuel,Rhys Plopinio, Jed Rodillas, Michael Undag, and Jay-El Viteño. They will be accompanied by pianist Mikhail Lastrilla, organist Armando Salarza, and instrumentalists Micah James Sanchez, Jacques Dufort, Jose Enrico Tuazon, Victoria Regalario, Ralph Taylan, Joy Allan Cruz, Giuseppe Andre Diestro, and Paolo Jaime Alcantara. ​Admission ticket to the concert on 6 March 2014 is Php 200. Students with valid IDs are entitled 50% discount and senior citizens, 20%. For details please cal 929-6963 or 981-8500 loc 2629 or email Eva at gondour03@yahoo.com. The University of the Philippiines College of Music presents the “IkoToki,” a new composition for a Jeepney Orchestra, composed by Dr. Maria Christine Muyco. This premiere will take place on February 28th, Friday at 6:00 PM at the Ampitheatre of the U.P. College of Science Complex on February 28, 2014, Friday, at 6 PM. The concert is free. The Jeepney Orchestra consists of instruments from jeepney parts, which the composer collected from junk shops around Quezon City and turned into sounding instruments. JP Hernandez constructed wind instruments such as paihip (flute), tambudoy (side-blown flute), and tatot (trumpet). Percussions consist of tubophones (tube xylophone) and IkoToki Tultogan (mini jeep as idiophone) put together by Allan Hernandez, Romeo Cudiamat, and Boy Rullog. There is also the bakagong (tongue metal drum) and tatsulok (triangle) from Boy Rullog. Cris Garcimo created the Jeepnilamella, a kalimba-like instrument made out of jeepney plates. Another section of the Jeepney Orchestra is the Speech Choir by the Arts Studies students of Ms. Krina Cayabyab. As the jeepneys highlight this concert, there will be actual jeepneys plying the circular Ampitheatre during the event. Ikot drivers Renato “James” Lino and Jason Reyes will be joined in by Toki drivers Julius Guevarra and Emmanuel Salvador. Music from sound installations will be part of the concert.